“The process of entering the house … should be a continuing and developing experience in space and in view, almost processional in character,” wrote architect Don Schlegel FAIA of his design of the Robb House. Located in Los Ranchos de Albuquerque, the Robb House was the site of the Foundation’s 2015 Annual Meeting on May 30. It was the home of the late John Robb, Jr., and Peggy Hight Robb — he a partner in the Rodey Law Firm and she an artist — from 1962 until their deaths in 2014. As meeting attendees entered the main door of the Mid-Century Modern landmark, the experience certainly fulfilled Schlegel’s vision. As part of the Foundation meeting, Ellen shared with members about the Robbs’ life in the home and why they built it. She said her parents were interested in living in an area more remote from the city center, with land and room for her to have a horse. In addition, Peggy Hight Robb was an artist and needed studio space. 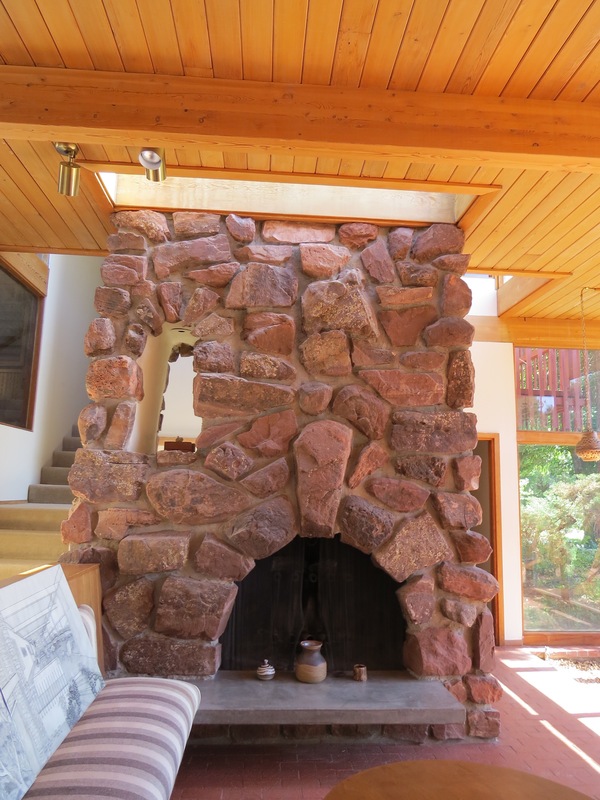 Red sandstone that was quarried in Golden, N.M. is a prominent feature both in the interior and exterior of the home. “The home’s design was inspired by my parents’ interest in something both contemporary and regional,” Ellen said. “We knew the house was ‘way out there’ with its design, but we also knew its significance.” She recalled when architects would come to the home for tours after it received an honor award from the Albuquerque Chapter, American Institute of Architects in 1965. “My father also wanted influences of New Mexico throughout the house,” she noted. Those influences are evident in features ranging from the red sandstone stonework quarried in Golden, N.M. to the Chimayo weavings used to upholster built-in benches in the living room. The built-in benches in the living room are upholstered with Chimayo weavings. Ellen Robb and her daughter Katy led a tour of the Robb House during NMAF’s annual meeting. NMAF Members conducted their meeting in the kitchen/dining room area. Pegboard was one of the Mid-Century Modern design touches prevalent in the bedrooms of the home. Peggy Hight Robb painted about 100 paintings in various media that hung on the walls throughout the home. To better accommodate her artwork, Peggy’s studio was added on to after the home was built. Amazing structure! I am sorry that my wife and I missed the meeting and the tour. Loved the photos. Don Schlegel really had it together when he designed the Robb house…Still contemporary and beautiful today…Young architects should study the symbolism in this house…fantastic…Don you should be very proud.